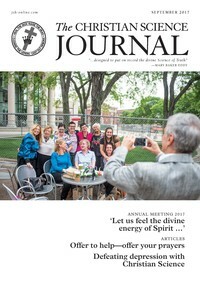 I greatly enjoyed reading an interview about The Christian Science Monitor in the June 2016 Journal. The Monitor’s principled standard of striving to report unadulterated news encourages idea-based solutions for global human needs. This interview reminded me of a time years ago when I became keenly aware of the importance of loving and supporting the Monitor and appreciating its healing influence. My home at the time overlooked a stand of beautiful oak trees and a striking view of the Cascade Mountains. But a dispute arose over the growth of the trees, which were beginning to obscure the mountain vista. The owner of the property below me decided to clear up the view. God takes no sides, and His children cannot collide but rather remain at one with God. Our neighbor asked us to designate trees that needed to be trimmed and told us that when they pruned the trees on their side, they would also do ours. But a third neighbor did not want any trees on his property touched and reported to us that a few of his trees had been cut. This neighbor and his wife had lived there for many years, and were good neighbors. But when they delivered a lawsuit over the tree trimming, I knew that I had to pray about this situation and clear up another view—my personal “view” of the situation. It had always been my experience that prayer is most effective when we listen for God’s plan and then take action, so I humbly asked God what I should do to heal this conflict. As I looked out of my office window, I spiritually reasoned that peace was the only possible outcome for this situation. God takes no sides, and His children cannot collide but rather remain at one with God and thus express the reflected light of divine Love. It was clear to me that our Father-Mother God, the only Mind, would guide all involved to a harmonious resolution. To me, these words summed up this human situation, and reminded me that I needed to “hallow” what I was perceiving. The word hallow means to honor as holy, or bless. So I knew not to react in anger, but to respond to our neighbor with blessings. It was very clear that the view I really needed was to see “more of heaven,” to recognize man’s divinely natural state of peace and brotherliness instead of accepting the suggestion of personal conflict, and to genuinely and humbly recognize the power and presence of God, the divine and loving Mind. This prayer brought two ideas. The first thing that was made clear to me was that our family shouldn’t feel hesitant about mentioning Christian Science, if it came up in conversation. At this point, I was just starting out as a Christian Science practitioner and felt shy about explaining to others what my job was. Second, we needed to take action and talk with our neighbors directly, because communication opens doors of understanding. I shared with my husband what God had instructed me through prayer, and he said he felt completely comfortable taking our neighbor out to lunch and accepted my inspiration to be open about Christian Science. As a result, at the lunch with our neighbor he mentioned our son’s attendance at a school for Christian Scientists. 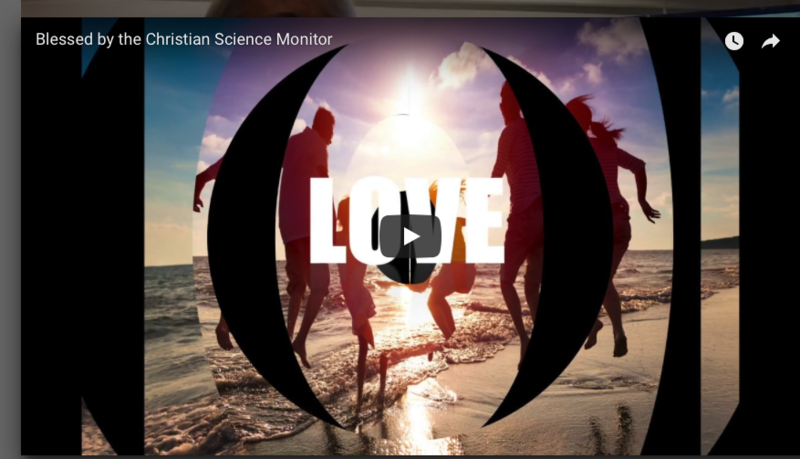 After learning that, the neighbor interjected that he had subscribed to The Christian Science Monitor for over forty years, and he praised the Monitor’s unbiased and thorough reporting, interesting interviews, and fresh ideas. And, coming at it as a medical professional, he said he appreciated the way the Monitor handled their coverage of the physical needs of humanity with intelligence, compassion, and a focus on resolution. Our neighbor’s attitude changed dramatically, and he became friendly. The shadow of this conflict was dispersed by the light of the Christ, Truth. In addition to the good I know it does for the world, the Monitor had clearly blessed our neighbor, and was blessing us in that moment by helping us connect. Soon after that lunch conversation, I received a notice that the lawsuit had been dropped. The shadow of this conflict was dispersed by the light of the Christ, Truth. Everyone was blessed because the peace and harmony of God—which had always been the divine reality—had been seen and evidenced. to be seen and felt, and in doing so, the Monitor’s spiritual perspective alerts us to factors that attempt to erode resolution or impede progress. As Mrs. Eddy said, on launching the Monitor, its timeless mission is “to spread undivided the Science that operates unspent. The object of the Monitor is to injure no man, but to bless all mankind” (The First Church of Christ, Scientist, and Miscellany, p. 353).